Can Robert Griffin III get into the form needed to bring the Browns that elusive W? Robert Griffin III is back. Again. So here we go, again. Your hope is that it’ll be different this time. Just like you wanted it to be different the last time. There’s still a chance, you think, that maybe, just maybe, Griffin can recapture the magic. That he’ll still be worth your attention. That you’ll sit on the edge of your seat in anticipation of what he’ll do next. That he’ll help make football great again. Then reality sets in. RG3? That dude is gone – and he’s not coming back. Just don’t tell Cleveland Browns head coach Hue Jackson. He doesn’t want to hear it. Jackson still leaves a light on for RG3. He’s eagerly awaiting his return. Let’s be honest: He’s counting on it. That’s why Jackson may have to be saved from himself. 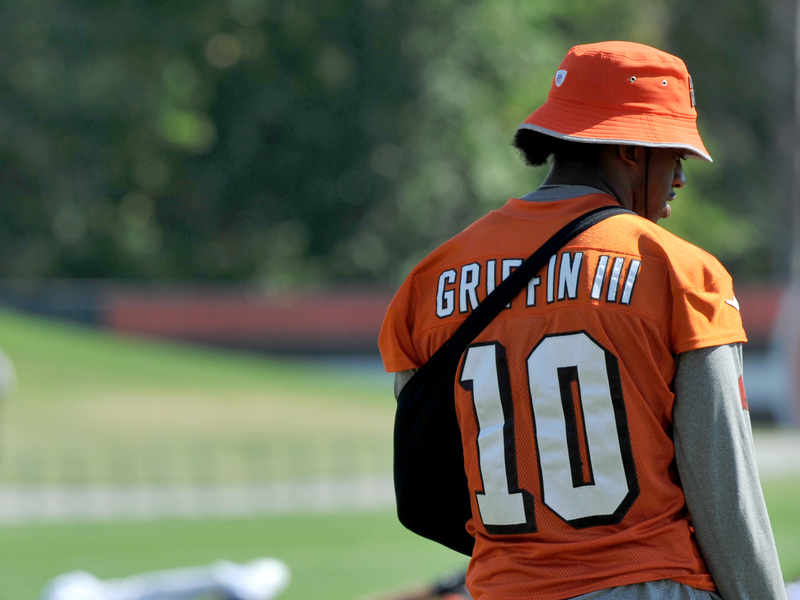 In naming Griffin the starter for Sunday’s game against the Cincinnati Bengals, Jackson emphasized that any opportunity to evaluate Griffin – who hasn’t played since he suffered a broken bone in his nonpassing shoulder during Week 1 – would help the Browns decide whether to bring him back in 2017. Bring him back? The fact that Jackson is still considering reinvesting in Griffin should set off alarms throughout the Buckeye State. Quarterback Robert Griffin III #10 of the Cleveland Browns walks onto the field during practice on September 22, 2016 at the Cleveland Browns training complex in Berea, Ohio. Cleveland will travel to play the Miami Dolphins at Hard Rock Stadium in Miami, Florida on September 25, 2016. After clearing the path for Griffin to be the team’s No. 1 quarterback (Griffin got all the first-team reps in the offseason program), Jackson watched the Browns’ starting offense struggle to score during an 0-4 preseason. Then Griffin was shaky throughout a 29-10 season-opening loss to the Philadelphia Eagles: He completed only 12 of 26 passes for 190 yards. Late in the fourth quarter, with the Browns trailing by 12, Griffin should have slid to avoid a collision with a defender standing between him and the first-down marker. He didn’t. As a result, Griffin has been sidelined the past 11 games. Actually, no. The fact that Griffin merely was on the field wasn’t enough. When has merely showing up ever been good enough? At this stage of Griffin’s disintegrating career, baby steps won’t cut it. In his first year with the Browns, Griffin didn’t deliver the turn-back-the-clock-to-2012 performance he needed. Continuing the failed experiment for another year would make about as much sense as going for it on fourth and 40 from your one-yard line. The odds of success are about the same. As much as Jackson hoped he could rebuild the 2012 AP Offensive Rookie of the Year, there’s no evidence that Griffin has even made incremental progress toward improving the shortcomings in his game – reading defenses, playing in the pocket, completing intermediary passes, protecting himself – that hastened his departure from the Washington Redskins after he had one of the greatest seasons for a first-year signal-caller in league history. Then there’s the matter of Griffin’s fragility. In less than five full seasons as a pro, Griffin has suffered three major injuries. Three. He’s simply not durable. Even when he has been healthy, except for his first season, the former Heisman Trophy winner hasn’t gotten the job done. Now, Griffin retakes the controls of a hot mess of a team, which, at 0-12, has such glaring personnel deficiencies across its reconfigured offensive line, you’re confident the brittle passer would be better off just kicking it on clipboard duty as the Browns stumble to the finish again. Jackson knows. Jackson may well be the last person in the league who thinks that. Despite trading four high-round picks for the pick to draft Griffin, the Redskins gave up on him relatively quickly, benching him for the entire 2015 season. Entering this week’s game in Cleveland, Griffin will have played in only one of his teams’ previous 28 games. There’s an old saying about players in the NFL: Your best ability is your availability. On that basis alone, Jackson should have already seen enough to realize Griffin isn’t the answer to the Browns’ perpetual quarterback problem. Around the league, it’s widely believed that Jackson still is determined to make the arrangement work because of Griffin’s powerful passing arm and athleticism. In Griffin, Jackson sees untapped potential. Ryan Clark gets it. Griffin still talks a good game. He sounds like a leader. “My job is to go out there and make them believe,” Griffin said. “Every single day that you come into the building, you have to show the coaches, show the organization, that you’re going to do what it takes to be that guy. When Griffin was at the height of his brief stardom, he was such a blast to watch. One moment, he’d rip off a talk-of-the-league touchdown run. The next, he’d drop the dopest deep ball you’ve ever seen. He did his thing at a time when the league office didn’t seem to mind guys having, well, fun. The NFL could use that guy now. Robert Griffin III (No. 10) of the Cleveland Browns warms up before the game against the Philadelphia Eagles at Lincoln Financial Field on Sept. 11 in Philadelphia. The Eagles defeated the Browns 29-10. But even if Griffin balled out in the final month of the regular season and the Browns got into the W column – based on Griffin’s performance and the team’s dearth of talent, that’s highly unlikely – it would just be fool’s gold. At best, several NFL offensive coaches say, Griffin is a long-term project as a pocket passer. Also, Griffin’s propensity for injury likely would sabotage any effort to remake his game. As an African-American head coach, Jackson doesn’t have time to keep tinkering with Griffin. Brothers don’t get the Jeff Fisher treatment. Fisher, the Los Angeles Rams’ head coach, has had two winning seasons in the last 12 years, including none since 2008. The Rams are 4-8. In all five of their seasons under Fisher, the Rams have missed the playoffs. Recently, it was announced Fisher has received a contract extension. For real. No joke. Of the 32 NFL teams, only five are led by black head coaches. It’s much more difficult for African-Americans than whites to rise to the highest rungs of the coaching ladder, stay there or get second chances. Jackson knows the deal. He did a solid job in his first opportunity as a head coach with the Oakland Raiders. Yet it took Jackson another five seasons to get another shot with the Browns. Although the Browns ownership intends for Jackson to return next season regardless of the team’s record, he will be under increased scrutiny from the opening kickoff of 2017, especially if the Browns become the first team since the 2008 Detroit Lions to go winless in a season. Trying to fix Griffin again would take too much of Jackson’s energy, which would be better spent on players who could actually help Jackson keep his gig. It’s great that Jackson wants to help Griffin. Jackson, however, has to win. Soon. He won’t do that while tied to Griffin. With Griffin, it’s the same old story. It’s not going to change. And if Jackson continues to hold out hope for a different ending, he’ll be the one getting the bad reviews.